G.W. Colton's Map of the Country 500 miles around Cairo, showing the Seat of War in the West, by G.W. Colton. 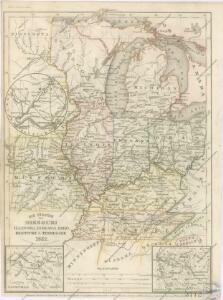 This Colton map from 1862 showing 500 Miles around Cairo details the western seat of the war with Illinois at the centre point and shows both Union and Confederate States. The map helps to give a sense of scale to the war as it stretched across much of the country, particularly the eastern and middle states with the southern Illinois town of Cairo close to the tempestuous Border States of Kentucky and Missouri and the northern part of the Confederacy. The map also lists fortifications in the Western and Gulf states and the principal towns and cities along the Ohio and Mississippi Rivers. Il paese de' Selvaggi Outagamiani, Mascoutensi, Illinesi, e parte delle VI. Nazioni. 134-35. Mich., Wis., Minn., Ia., Mo., Ill., Ind., Ky. Tourist through car line, Louisville & Nashville Railroad. Plan of Captain Carvers Travels in the interior Parts of North America. County map of Michigan, and Wisconsin. Sheet 3: United States of Nth. America.